Gaithersburg, Md., January 28, 2013 /3BL Media/ — Sodexo released its annual Workplace Trends Report today, noting among dozens of findings key trends such as 86 percent of Millennials entering the workforce now say they would consider leaving an employer whose values fell short of their expectations, clearly indicating that the emerging workforce is motivated by positive, people- and community-centric workplace practices and initiatives. 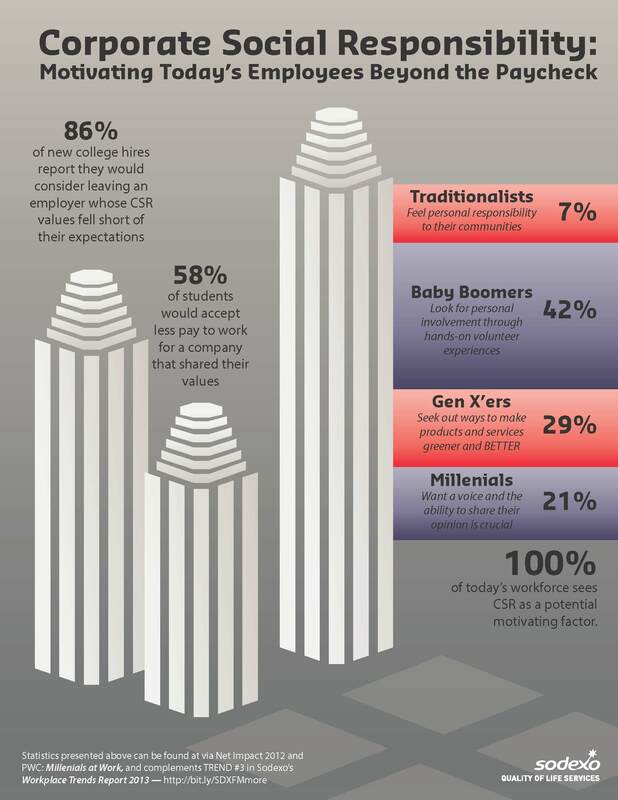 In fact, the report shows all four generations in the workforce see corporate social responsibility as a potential motivating factor at work. The 2013 Workplace Trends Report from Sodexo, global leader in services that improve Quality of Life, offers fresh insight into drivers affecting the people, workplace environment and community impact issues faced daily by leaders and discussed and debated in Board Rooms across the U.S. and around the world. Among its 12 leading trends, the Report takes a deep dive into issues ranging from recruiting and mentoring talent to the corrosive effects of workplace bullying, and from the distinct benefits of sustainable working environments to integrated people and facilities solutions that deliver increased individual and organizational performance. Leading indicators from the Report cite, for example, that the way the marketplace engages with prospective employees today is vastly different than it was just five years ago. Today, social media and mobile communications dominate over traditional e-mail campaigns. In fact, a recent study released by Jobvite found that 92 percent of U.S. companies used social media networks in 2012 as part of their recruitment efforts. Additionally, seven out of 10 employers report having successfully hired a candidate through social media – up from 58 percent in 2010. While significant time and resources are spent on recruiting top talent, the Report notes that once onboard, 35 percent of the U.S. workforce report being bullied at work – defined as repeated, harassing behavior that is deliberately intended to cause harm to individuals and prevent them from excelling at work, according to the Workplace Bullying Institute. This emerging issue is at the forefront of human capital management and represents a real workplace psychological health concern that can truly hurt a company's bottom line. The Report notes that facilities management is essentially now a strategy and not just a tactic, or worse yet, an afterthought. Sustainability – an office feature once considered distinctive – has become table stakes. Whether it’s economics, environmental consciousness or both, must-haves from clients, even those with no interest in green building, now include recycled products (including buildings), locally sourced and sustainable materials, energy-efficient HVAC systems, and better indoor air quality. The trend is an unmistakable shift toward offices designed to attract and retain top talent while emphasizing productivity over cost savings and quality of life per square footage. Integration 2.0 is another forward-looking concept identified by the Report. The needs of the current working generation are significantly more complex and dynamic, and creating efficient, effective, and flexible work environments that take into account total well-being has become a critical decision point for organizational leaders. The Report finds that progressive organizations are now understanding and solving for human needs when developing workplace services and solutions in unique ways, such as designing strategic Life/Work Ecosystems and evaluating the impact of these ecosystems on improved service and people effectiveness and well-being. 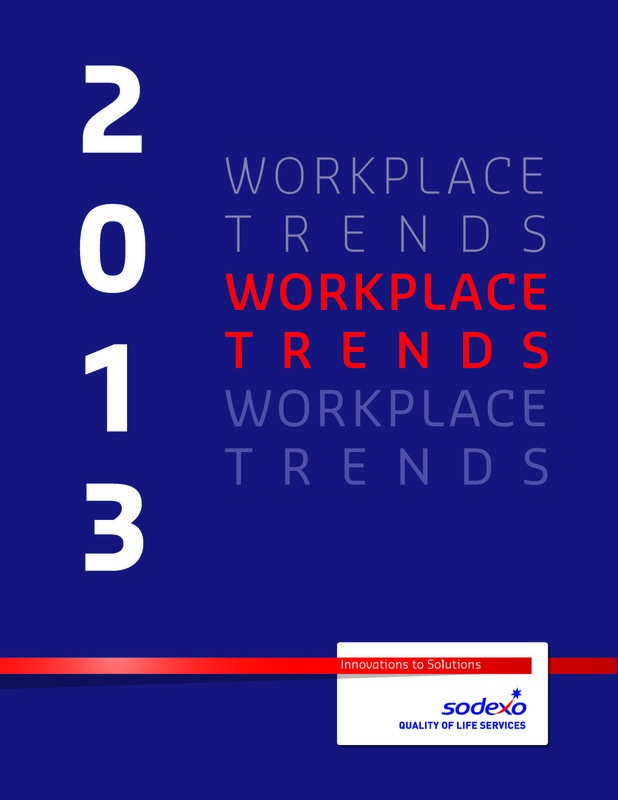 The 2013 Workplace Trends Report combines insight from clients, academia, principal research, and leading facilities management and human resource trade organizations. Sodexo’s researchers used mixed-method research to monitor and collectively examine trends that affect the quality of life of their consumers in the workplace. This approach included traditional quantitative measures such as end user satisfaction and preference surveys, psychographic analysis at client sites, social media monitoring and a literary review consisting of consultant reports, academic and trade journals, and information from industry associations. The 2013 Workplace Trends Report represents a sample size in excess of 1,000 end users. Sodexo is the global leader in services that improve Quality of Life, an essential factor in individual and organizational performance. Operating in 80 countries, Sodexo serves 75 million consumers each day through its unique combination of On-site Services, Benefits and Rewards Services and Personal and Home Services. Through its more than 100 services, Sodexo provides clients an integrated offering developed over more than 45 years of experience: from reception, safety, maintenance and cleaning, to foodservices and facilities and equipment management; from Meal Pass, Gift Pass and Mobility Pass benefits for employees to in-home assistance and concierge services. Sodexo’s success and performance are founded on its independence, its sustainable business model and its ability to continuously develop and engage its 420,000 employees throughout the world. Sodexo, Inc. (www.sodexoUSA.com), leading Quality of Life services company in the U.S., Canada, and Mexico, delivers On-site Services in Corporate, Education, Health Care, Government, and Remote Site segments, as well as Benefits and Rewards Services and Personal and Home Services. Sodexo, Inc., headquartered in Gaithersburg, Md., funds all administrative costs for the Sodexo Foundation (www.SodexoFoundation.org), an independent charitable organization that, since its founding in 1999, has made more than $17 million in grants to end childhood hunger in America. Visit the corporate blog at www.sodexoUSA.com/blog.